Oscar Wilde is one of our great playwrights, poets and wits, but his work has rightly been overshadowed by the significance of his life. He has become a symbol of the hypocrisy of Victorian England - apparently happily married and a father, Wilde embarked on a series of homosexual affairs that were tolerated by polite society while they were with people lower down the social ladder and discreet. But when Wilde dared to have a highly publicised affair with Lord Alfred "Bosie" Douglas, son of a boorish, violent, aristocrat, he ended up in prison. This tragic fall, from feted and celebrated writer to spat upon criminal was harsh - from luxury to hard labour - from beloved father to exile. When Wilde was released from prison he gave us two great works - The Ballad of Reading Gaol and De Profundis - but nothing of substance thereafter. He lived a rakish life on the Continent, cut off from his family, alienated his remaining friends with a temporary reconciliation with Bosie, and descended into poverty, ill health and death. Understandably the many film adaptations of Wilde's life have refrained from putting this often sordid tale on screen. They conveniently end when he enters or leaves prison, or reconciles with Bosie. We therefore remember Wilde as young, in love, and hopeful. THE HAPPY PRINCE refuses to let us off the hook that easily. 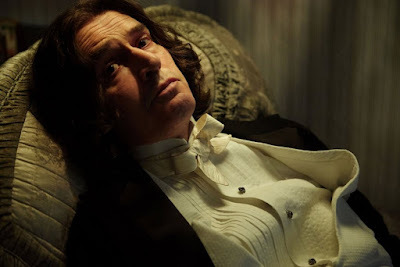 The handsome Rupert Everett allows himself to transformed with a fat-suit, false teeth and make-up into an old, weathered, ashamed, drunk and hopeless man. There are occasional flashes of Wildean wit, but really this is the story of a man broken by love, hypocrisy and simple lack of funds. He cannot write - whether because of the trauma he has experienced, or the stress he still endures, or because of the distraction of Bosie. He knows his life is ending but cannot stop hurtling himself toward self-destruction, spending freely, loving freely, until the end. Even a romantic death bed is interrupted by violent vomit. We cannot escape all the contradictions - seemly and unseemly - of Wilde. Everett's performance is magnificent and unflinching in a way that feels eons beyond the more manicured performances of previous films. And he is ably supported by a cast including Emily Watson and Colin Firth as Wilde's wife and good friend Reggie. We are also fortunate in the casting of Wilde's warring lovers - Edwin Thomas as his devoted and loyal literary executor Robbie Ross, and TV's Merlin, Colin Morgan, as the beautiful but selfish and fickle Bosie. The performances demand to be seen. My regret is that Everett did not succeed in finding a more seasoned director to helm this wonderfully acted, daringly non-linear script. He makes another daring choice to have an almost verite style to his filming, with a handheld camera and lots of POV shots. It's effective in some places - and many costume dramas can feel stuffy and old-fashioned when they match a static camera with restrictive costumes. But I found the camera too distracting, drawing my attention away from the superb performances. There are also certain cuts and juxtapositions that felt too on the nose, or too forced which I felt a more seasoned director might have avoided. So this is a flawed film, but a deeply earnest, compassionate and well-acted one nonetheless. THE HAPPY PRINCE has a running time of 105 minutes. The film played Sundance, Berlin and BFI Flare 2018. It opens in Germany on May 24th and in the UK on 15th.